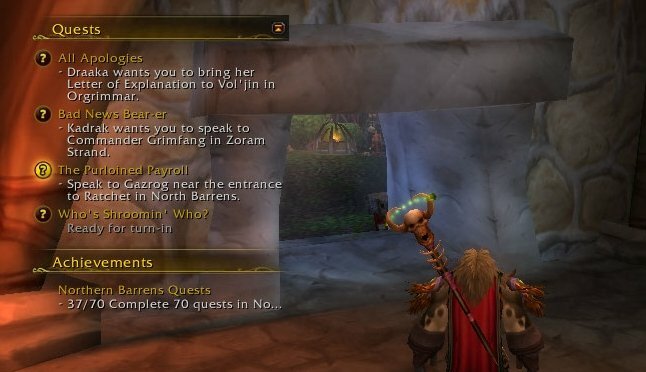 Auz's QuestWatcher unlocks the default blizzard Quest (Objective) Tracker so that you can place it anywhere on the screen simply by dragging it. All the functionality of the original tracker has been left in place simply because, it works. There are options to have it Hide in Combat, lock it's location, and scaling. - Fixed an issue where the tracker would not hide in combat. Yes, it is swatter. I do not get the error with Stubby enabled and Swatter disabled. If swatter is enabled, this error occurs. it happens when you /reload the UI or log out/in etc. I am not sure where the conflict is between QuestWatch and Swatter - if it's a conflict at all. But it does not seem to effect QuestWatch or Swatter functionality. Close the error and QuestWatch functions as it should. @Drizz - Thank you for helping to identify the issue. Last edited by Auz : 02-01-15 at 11:53 PM. Update 1: If I run only AQW I do not get the error. Update 2: If I remove "Stubby" and "Swatter" from my loaded addons... I don't get the error. (Both are from the Auctioneer addon I think). Here error with only 3 addons... Yours, and Stubby and Swatter. Last edited by Drizz : 02-01-15 at 03:20 PM. I have been testing AQW for about a week with different characters at various levels and quests. I have not run into this error but, a friend of mine who is helping me test it, ran into this error today upon logging in. I believe I have fixed it but, since I have never gotten the error I have to wait and see if if I have actually fixed it or not. Please, if you have downloaded this addon or any of my other addons and encountered any errors, let me know. This is the error they sent me and for the life of me, I can not reproduce it. I have asked them to delete/move/rename their WTF, Interface, and Cache folders and to load AQW on it's own. Last edited by Auz : 02-01-15 at 10:23 AM.